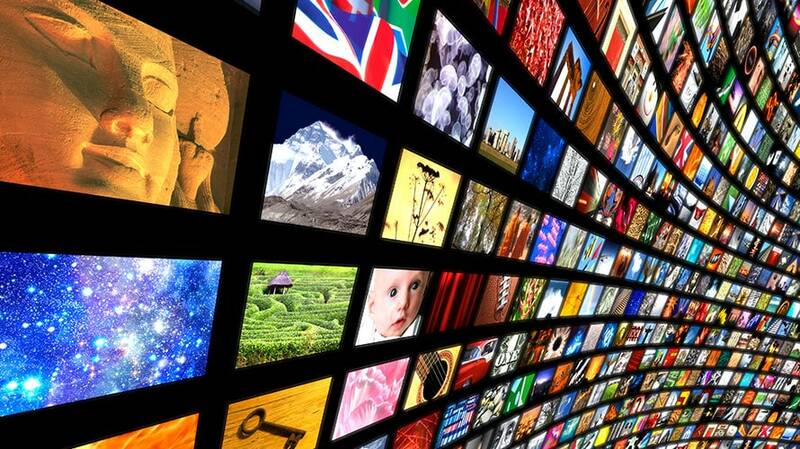 In 2011, 266 scripted shows aired on broadcast, cable and streaming. Peak TV has peaked yet again. 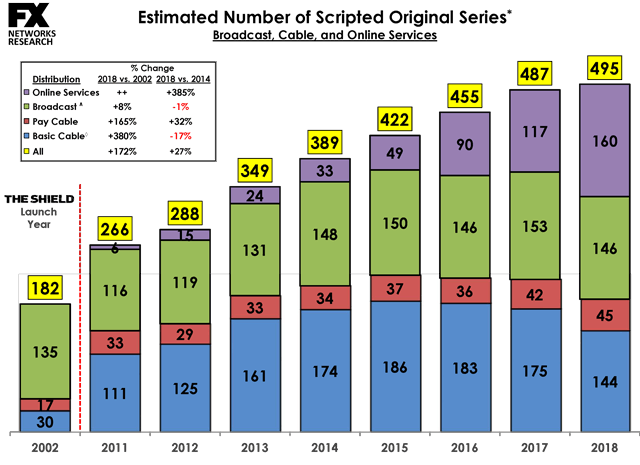 The number of original scripted TV series this year jumped to 495—just barely missing 500—as the annual output from streaming services surpassed the tallies from broadcast and basic cable for the first time. 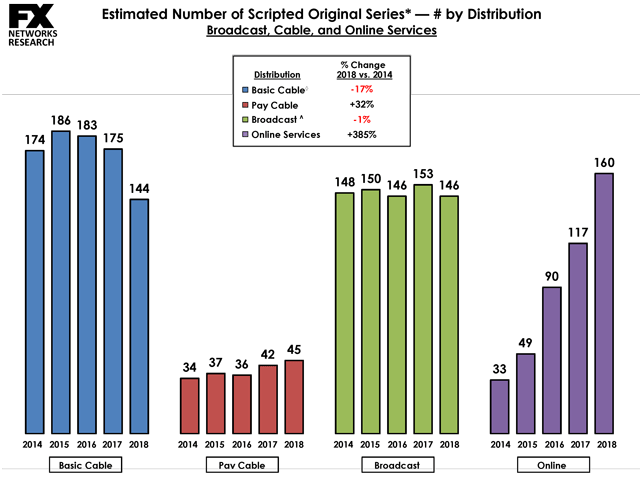 According to new data from FX Networks Research, 160 streaming series aired this year, compared to 146 shows on broadcast TV, 144 on basic cable and 45 on pay cable. 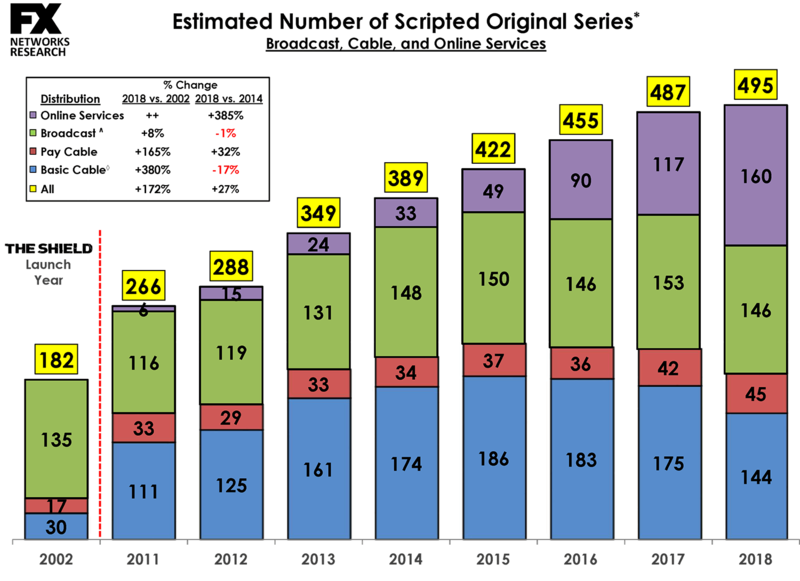 In 2017, 487 scripted series aired in total on streaming, broadcast and cable networks. That number doesn’t include the estimated 750-plus unscripted series that also air on those outlets. 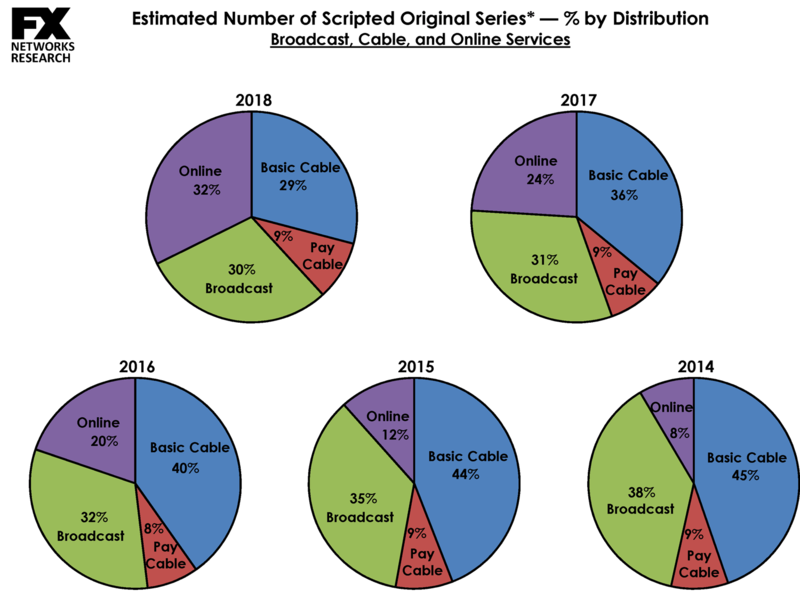 Streaming now accounts for 32 percent of all original series, as broadcast slipped to 30 percent and basic cable fell to 29 percent. 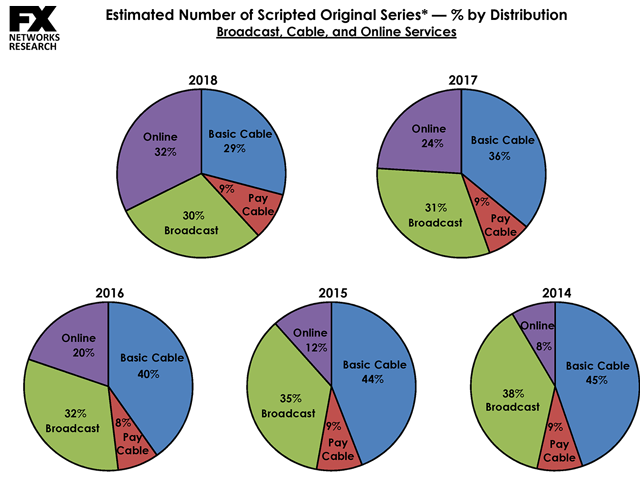 Over the past four years, the number of scripted series from streaming services has increased an astounding 385 percent, while basic cable’s output fell 17 percent in the same timeframe. 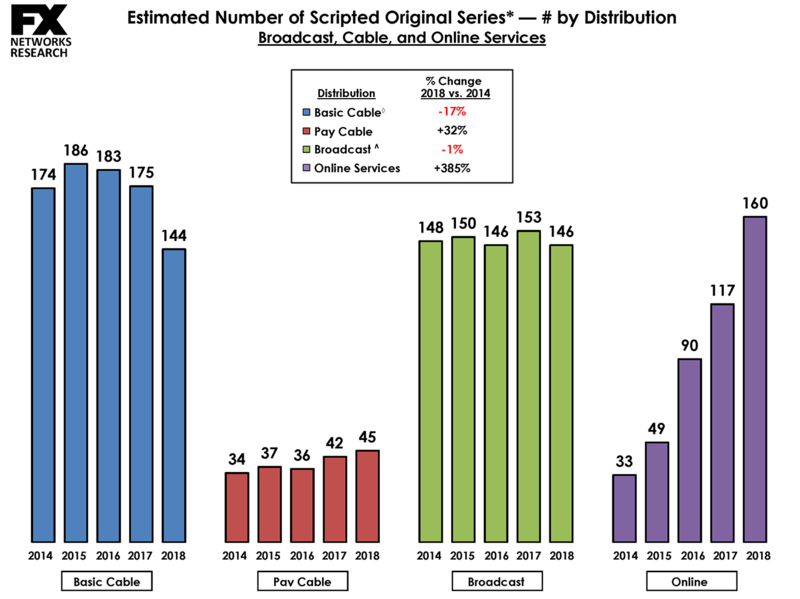 Pay cable was up 32 percent, and broadcast was down 1 percent. The basic cable decline, as Adweek noted in October, came after more than a dozen networks that had dabbled in scripted—including A&E, Bravo, CMT, Discovery, E!, ID, MTV, TV Land, VH1 and WGN America—decided within the past year to either pull out of the space entirely, or significantly curtail their efforts there. Many of them were unable to compete with the increased streaming output from outlets like Netflix, which spent $8 billion on original programming this year. 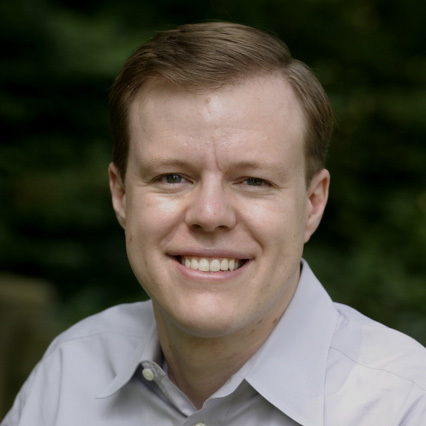 Landgraf said in 2015 that there was “simply too much television,” but in August, he said his thinking had evolved, and that he now believed there was “too much narrative” on TV, which is overwhelming for viewers. Now, “everything feels vaguely familiar to them. That’s something we struggle with,” he said.